Saraswat Co-operative Bank Limited is the first Urban Co-operative Bank to set up a ‘Unified Treasury’ incorporating Foreign Exchange desk and Money Market desk. The Treasury is located in the city of Mumbai and has a well equipped dealing room with ‘Reuters’, ‘Bloomberg’ and ‘Congencis’ systems. All the treasury operations are completely computerized. 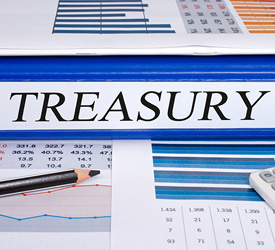 The Treasury complies with the statutory obligations of maintaining C.R.R. and S.L.R. for the Bank apart from managing overall funds. The Treasury also publishes the market update every fortnight for private circulation which is available on this website. This desk deals in the Government securities, Treasury Bills and money market instruments. The Bank also deals in retailing of Government Securities and other debt market securities.